Wait! What is that creepy-looking thing off in the distance there? Yea, that older, wooden looking building in the middle of downtown Gatlinburg? It’s the beginning of August, why is there a man that looks like he’s been zombified walking down the street? Well, that’s because we’ve stumbled upon one of the year-round haunted houses in the area, Ripley’s Haunted Adventure! Yes, you read that correctly, “year-round,” meaning you can visit this attraction on any one of the 365 days in the year (or all 365 of them, if you’d like). This attraction spans over 10,000 square feet and offers live, haunting entertainment throughout the early evening and night. So for those who are terrified, visit during the early evening as the monsters don’t have as good of aim then, er, uh, well it’s easier to see them coming while you are waiting in the daylight anyway. We will say, we’ve been visiting haunted attractions for years and this one nailed it on the head at offering haunting entertainment that won’t absolutely traumatize the younger ones. It’s not super gory; it’s not brutal or offensive and the actors won’t touch you. This attraction is truly family-friendly… although, they don’t permit anyone under the age of 6 to enter. 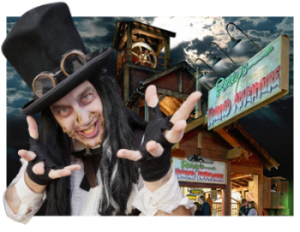 Year-round haunts don’t have the throughput during the off-season as they do during the Halloween months of September and October, so if you attend in one of these off-peak months (like we did), prepare to face only a few actors. In our case, we laid our eyes on two. One was encountered before entering and the other after entering; though he was beheld in several different scenes. In our experience, it is possible for two actors to be sufficient for such an event. Unfortunately, that was not the case on this adventure. Even though the main character may have been operating some of the effects that we experienced throughout the house, he only interacted with us directly on a couple of occasions… mostly in the beginning, leaving the rest of the house reliant on special effects alone. We did see a flashlight shining around behind us at one point (he was checking scenes for errant guests), and after he realized we weren’t as far along as he thought, he turned off the light and brilliantly saved the day by… meowing at us. Speaking of believability, the first actor that we came across wasn’t in character, and he didn’t really get into character… even after welcoming us to the event. He had multiple opportunities to try and sneak up on us or at least act like a spooky, sick or sadistic character… but alas, he did not. We do give props to the other actor, though, for making a decent effort to stay in character. He used appropriate dialogue and we must say that he was rather uninviting (but in a good, haunted house way). He made our group members keep a hand on the person’s shoulder in front of them and, when we removed them shortly after, he scolded us for doing so and made us do it again. By golly, don’t take your hand off your buddy’s shoulder! All in all, we left feeling rather disappointed by this crew. Now, in all fairness, we did show up pretty late at night, so they had already been there for a while and were probably ready to close. But, it was a Friday night, which should be one of the busier nights of the week. In cases like this, a little more effort could have gone a long way. The characters were wearing matching attire, which consisted of medical uniforms that matched the asylum areas of the house. One looked like he had caught some sort of flesh-eating virus, while the other had a very realistic abnormality (we still aren’t sure if it was real or not). The costumes had a bit of grunge to them and were appropriate for some areas, but not all of them. We weren’t really expecting to walk up to a wooden-framed, rustic mansion while getting greeted by someone in mostly clean, blue scrubs. But hey… it beats street clothes. Finding the Haunted Adventure was extremely easy for us. We parked just down the street and across the road in a $5 lot that, surprisingly, had plenty of empty spaces for as busy as the streets seemed. The ticket booth was accompanied by a large “Ripley’s Haunted Adventure” sign that made the place pretty hard to miss. Not only that, the spooky, not-so-friendly display kind of sticks out like a sore thumb on the main Gatlinburg strip. Navigating the attraction was also a breeze and, when needed, the staff and ample signage were able to direct us where we needed to go. An actor closely watched as we boarded their moving coffin cage, ensuring we were holding on and properly prepared for our ride to the entrance. This attraction seemed very safe and we didn’t notice any trip hazards or anything that could be dangerous to visitors. Being a tourist attraction, finding their hours of operation and ticketing info proved to be very easy. A quick search on Google and clicking on to their website yielded all the information we could ask for. There are also coupons on there if you purchase your tickets online, so be sure to take advantage of those. This was by far, one of our favorite aspects of this attraction. The wooden structured, multi-level building should promptly catch the attention of any haunt-seeker. The additional creepy decor, rustic fencing and displays of the dead are enough to let you know that this isn’t just another one of those “old time photo” shops. Unfortunately, other than the creepy vibe coming from the building and outside decor, we didn’t encounter anything else to help in building our anticipation to enter. That’s not to say we weren’t excited (the look of the building took care of that on its own), but adding more to the feeling of the mansion being inhabited by some spooky spirits would’ve been welcomed, rather than questioning whether or not they were still open… much less aware that someone was standing in line. Take advantage of any selfie opportunities with the outdoor decor while you wait; it will help pass the time. There was a variety of effects to be seen at Ripley’s; their house is mostly reliant on them. Most of them are what we call “old-school,” utilizing classic, low-tech pop-scare techniques that tug at your Halloween heart strings. Some of them interacted with us quite effectively, as did some of the sounds effects, which were very realistic and at the appropriate volume for this style of house. There was one area that had louder effects paired with a giant animatronic, which created a killer combination! For as long as this attraction has been opening its doors, we didn’t expect to come across as many areas that seemed to be unfinished as we did. Now, some areas were decorated well; we were impressed by the industrial/toxic area surrounded by green water. But, we also wondered if the green water was supposed to be doing anything besides laying there stagnant (we probably wouldn’t have noticed it if we hadn’t looked over the railing). Watch out for bloody intestines as you make your way through, don’t fall in the spinning tunnel and watch your step; you never know what may be waiting for you around each corner or even under your feet! We got some mixed information on this during our tour. Many of the areas didn’t seem to connect very well, as the rustic building, coffins and old mill “feel” didn’t go along with the sanitarium theme that was encountered first thing. There was a lot of darkness, death, decay and colorful decor mixed in. We stumbled upon a toxic waste area, a swamp-like area, the twilight zone and padded walls which left us a bit confused on what their theme really was. Despite some shortcomings, we did manage to fall victim to several startle scares during our tour. One of them even made one of our team members levitate (if only for a fraction of a second)! We think that Ripleys has the right setup to get at least one startle out of most visitors; but, if you are afraid of tight spaces or dark areas… well… you may be in for a treat! They have taken more of an old-school fright approach while relying on their victim’s minds to create some scares for them. If you visit, you will realize what we are talking about. If you don’t go to these types of events often, you are likely going to be far more unsettled than we were in a few areas, as your mind will play tricks on you and it’s actually kind of difficult to predict a lot of the scares here. We purchased our tickets online for $12.99, which is $1.00 cheaper than at-the-door sales ($13.99). We were in Ripley’s for somewhere between 12 and 15 minutes, which makes the price pretty fair compared to most other haunted attractions. We purchased tickets to be entertained and, in the end, we left laughing, so they did their job. Did they do it as good as they could have? Doubtful. But, for an off-season haunt, it seemed like it was worth the $12.99 to us, especially since we had never been here before. If you HAVE been before, we aren’t sure how much it changes from year to year, but judging from the scenery and actor interaction, you may get bored with it if you go more than once every few years. We’ve seen a lot of reviews on this attraction, both good and bad, so this is our final conclusion. If you are an avid haunted house seeker that is hard to scare, you may not get your fright fix here. But if you are someone who doesn’t visit haunts very often (or at all), you have younger ones that want to go, or you gets the heebie-jeebies every time the wind blows, then you are probably going to have a blast in this place! If you’ve been to the Gatlinburg Ripleys Haunted Adventure during the Halloween season, please leave us a Guest Review (below) and let us know how it was!